The high net primary production in tropical ecosystem were more supported by the rapid organic-cycling than their low fertility weathered acid soil, due to the high temperature, rainfall, moisture and light intensity along a year. Tropical natural resources have a high biomass productivity but still less economical values. New paradigm from extraction to empowerment of natural resource will give new challenge to shift from red- & green economic to blue economic concept that should be more smart, global, focus, and futuristic for sustainable development. 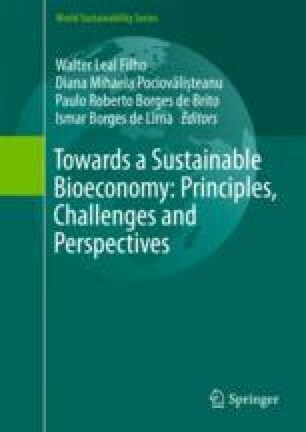 Integrated Bio-cycle System (IBS) is a closed-to-nature ecosystem on landscape ecological management to manage land resource (soil, mineral, water, air, microclimate), biological resources (flora, fauna, human) and their interaction to have more high added value in environment, economic, socio-culture and health aspect. The bio-economic chain should be managed through 9A (Agro-production, -technology, -industry, -business, -distribution, -marketing, -infrastructure, -management, -tourism) with 9R (reuse, reduce, recycle, refill, replace, repair, replant, rebuild, reward).The system has multifunction and multi-product, that will meet with the expected basic need for daily-, monthly-, yearly- and decade’s income at short-, medium- and long- term periods for small, medium, and big stakeholder. IBFS can produce “gold of life”, such as: yellow gold (food, rice, corn), green gold (vegetables), brown gold (plantation wood), red gold (meat), white gold (milk, fish), black gold (organic fertilizer), transparent gold (water), gas gold (oxygen), blue gold (biogas, biomass energy, bio fuel), king gold (herbal medicine), prosperity gold (tourism), inner gold (mystic). IBS with ABCG (academic, business, community, government) networking has a good prospect for sustainable environment and life.